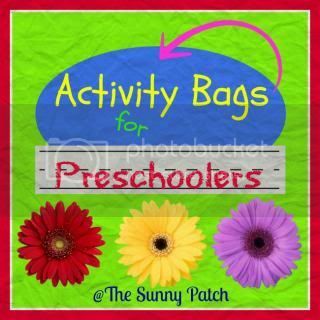 Activity Bags are a simple way to keep an organized group of projects together and ready to go. So when your little one wants to "do school" with the older kids, you have a fun project ready for them to tackle! The idea behind this concept is simple: decide on a project and put all the necessary pieces in a ziploc bag (the kind with the zipper on top, not the kind you have to press together) so a child can pull out a bag and have all the components for that activity in one place. When you have a variety of Activity Bags you'll be able to entertain your little ones at the drop of a hat! Remember to keep all the bags in a box in an easily accessible area. When your child wants something to do, pull one of the activity bags out of the box. I also like to have some quiet Activity Bags ready to head out the door with us so I keep a few in a "to go" bag. It's always ready for a quick appointment or church service - someplace I know I'll need to keep my daughter quietly occupied for a period of time. In her church bag I keep an assortment of the ideas from below, a few small stuffed animals, a sippy cup of water, a small container of wet-wipes, and a snack. Once in a while I will swap out the activities in her church bag for other activities. I also have a few of the activity bags in her room that she is allowed to use during her quiet time. So here we go - it's time to make some Activity Bags! You'll want a supply of zipper-topped bags (this kind is perfect), some index cards, packing tape, and a pen. You'll want the kind of bags that have zippers instead of the kind that needs to be pressed together. The zippers are much easier for little hands! For each bag from the list below that you decide to make, write simple instructions on an index card and use the packing tape to secure it to the front of a zip-top bag (that way you'll remember what the goal is for the activity instead of trying to figure out what those beads and pipe-cleaners are for!). Put together the bag: Put beads on a pipe cleaner, following a specific pattern (ex: red, blue, green, red, blue green) and glue the beads on each end to keep them in place. Provide the child with another pipe cleaner and enough beads to complete the same pattern. Objective: Show the child how to follow a pattern. Another option: Don’t glue on the beads, just let the child string the beads as he wants. Put together the bag: Put all the supplies in a bag. Objective: Show the child how to make pictures and patterns on the sandpaper with the yarn. Put together the bag: Make a few head shapes from felt. From the other colors make eyes, ears, noses, mouths, hair, moustaches, etc. Use the yarn to make more hair. Attach Velcro dots to the backs of the googly eyes. Objective: Let the child make silly faces from the materials provided. Put together the bag: On each plastic cup make a series of dots (on one cup put one dot, on another put two, on another put three, etc.). Provide as many objects to count as necessary to fill all the cups. Objective: Show the child how to put the objects in the cups according to how many dots are on the cup. Put together the bag: For each color of pasta – put ½ cup rubbing alcohol in a small container. Add food coloring and stir. Put in some pasta and mix. When the pasta has absorbed as much color as you want it to, pull it out with a slotted spoon and let it dry. Objective: Have the child separate the pasta by color. Another option: Buy colored paper clips and have your child sort those. Put together the bag: Put the items in a bag for storage. Objective: Show child how to thread the lace through the holes in the plastic canvas. Put together the bag: Trace each shape onto an index card and put the shapes and cards in a bag. Objective: Show the child how to match the shape to its outline. Another option: If you find foam letters or numbers, this works with them as well. Materials needed: glue stick, small rectangles of waxed paper (as small as index card size or as large as a half-sheet of paper ), small squares of tissue paper (1”x1”) in various colors. Objective: Show the child how to use the glue stick to glue the pieces of tissue paper. When he has completed one, tape it to a sunny window. Put together the bag: Put all supplies in a bag. Put together the bag: Write a letter of the alphabet or a number on each index card. Cover each index card with clear contact paper. Put these cards, along with the play dough in a bag. Objective: Show the child how to roll out “snakes” with the play dough. Use these to make the letter or number shapes on the cards. Put together the bag: Put the letters on the cookie sheet and then in a bag. Objective: Let the child make words, practice his letter sounds, etc. Objective: Let the child write on the chalkboard. Objective: The child gets to pick something out of the bag when he complains that he is bored. Put together the bag: put the rice in a small Ziploc bag put all the materials in one bag. Objective: Show the child how to pour and measure. Put together the bag: on one set of index cards write the numbers 1 through 10 on individual cards. On the other set put stickers to correspond with each numbered card. Objective: Have the child match the number card to the with the appropriate sticker card. Put together the bag: Make a clock – write the numbers on the paper plate for the clock face. Make a minute hand and an hour hand from construction paper and fasten to the paper plate with the paper fastener. On the index cards draw clocks with different times and write the time underneath each clock. Objective: Show the child how to match the paper plate clock to the times on the index cards.